After you have selected the menu option the C# source code is formatted with correct whitespaces. 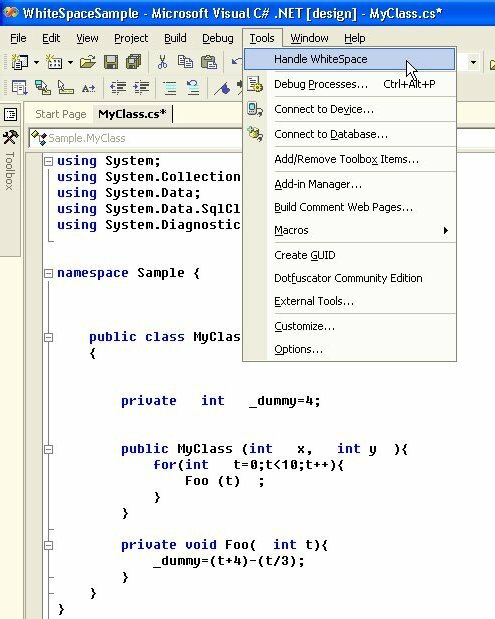 Writing clean C# code has become easier with this Add-In. I hope you enjoy using it. I thank Heindirk de Laat for providing me the code for the most difficult part of the program. I only added some extra regular expressions and transformed it into an Add-In. 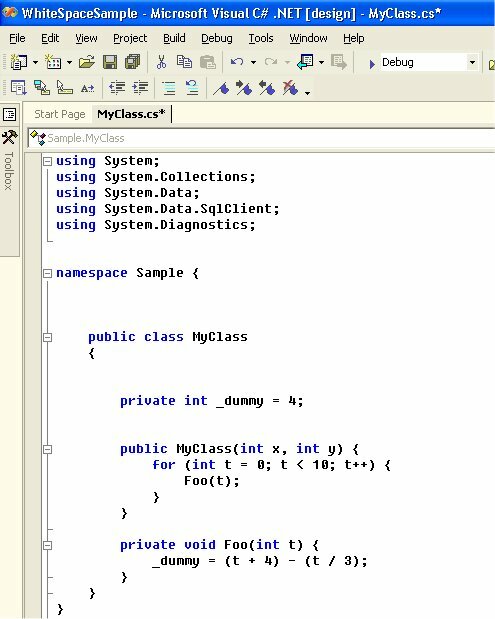 I'm testing Visual C# 2005 Express Edition Beta and I really like it. It has all of the features which I need to build Windows Forms applications. The Editor has also all new IntelliSense, Refactoring and Code Snippets features. They work great and really can boost productivity. I have tested it on a PC with only 256Mb of ram. This is for the beta not enough. You need at least 512Mb. I'm using the Online MSDN Help, it works OK. The looks are good but I find it difficult to get to the 'overview' of a class. For professional development I would advise to use Visual Studio. For hobby work use the Express versions. It took me today some time to figure out how to sort an array of strings case-sensitively. The default behavior of the Array.Sort() uses an default Comparer object which should be case-sensitive. When I tested this I found out that I had misinterpreted the definition of 'case-sensitive'. What I wanted was 'Oridinal' sorting. So I created an OrdinalStringComparer class which implements IComparer and I got what I wanted.